Smartphone design just isn’t as interesting as it used to be; top phones are all basically beautiful slabs of glass and metal with glimmering displays that make you go “ahhhhh.” Last year, in an effort to combat the boredom, LG launched the G5, an ambitious disaster of an Android phone, which was most notable for its central gimmick, a “magic slot” which allowed you to plug-in modular accessories, like cameras and speakers. At its core, the tech was poorly designed, but worse was the fact that nobody cared about being able to trick out a phone with modules. With the new G6, LG hits reset, and tries something entirely new, which as it turns out, means getting back to the basics. The magic slot is completely gone. Based on my short time playing with the G6 in a briefing, it’s almost shocking how practical the design choices are compared the clunkiness of the magic slot. It’s hard to tell that the new phone even comes from the same lineage as the G5. There are two important features most geeks will notice right away. First, there’s the 18:9 ratio display, the first contemporary smartphone to use this burgeoning format. Even though it’s only slightly taller than the 16:9 ratio featured on most popular phones today, it’s something you’ll notice immediately. The new format essentially lets you see more of the screen in landscape mode while watching newer shows (such as Netflix’s Stranger Things which was filmed in 18:9), and it also helps with multitasking. LG did a great job of splitting the screen in half in many of its default apps. The camera app, for example, divides the screen into two perfect squares. The top half works as a viewfinder while the bottom half shows your last photo taken. Other apps like Calendar and Email have also been redesigned to make use of the new format in landscape mode by dividing the screen in half. The point is usually to make it easier to browse when the phone is turned on its side, however, it didn’t improve the experience enough to make me want to use my phone in landscape mode all the time. The G6 comes equipped with a slightly unusual 2880 x 1440 resolution OLED display. You’ll notice the resolution numbers are slightly askew because of LG’s choice to embrace the 18:9 format. Regardless, the screen is just like most other high-quality, non-iPhones on the market. Another thing you’ll notice right away is how incredibly small the bezels are on all sides. The G6 doesn’t have any physical buttons, aside from the volume rockers on the sides. It’s literally a slab of glass and metal. My guess is LG is trying to distance itself last year’s blunder with this no-nonsense approach. The phone didn’t exactly feel super premium or luxurious—it was a little too thick for that. The phone is 7.9mm thick compared to the iPhone 7 Plus which is only 7.3 mm thick. Still, it was slightly thinner than the Google Pixel XL, which is a hulking 8.6 mm, so it’s not the fattest option. It surprisingly felt like something that I could easily imagine myself using a regular basis, despite its noticeable thickness. The aluminum body was sturdy, even though it was noticeably thicker than my iPhone when I held it. The back of the phone is practically identical to last year’s model, and it makes sense because it’s one of the few things that LG has figured out. On paper, however, it appears that LG has scaled back some of the camera’s capabilities. 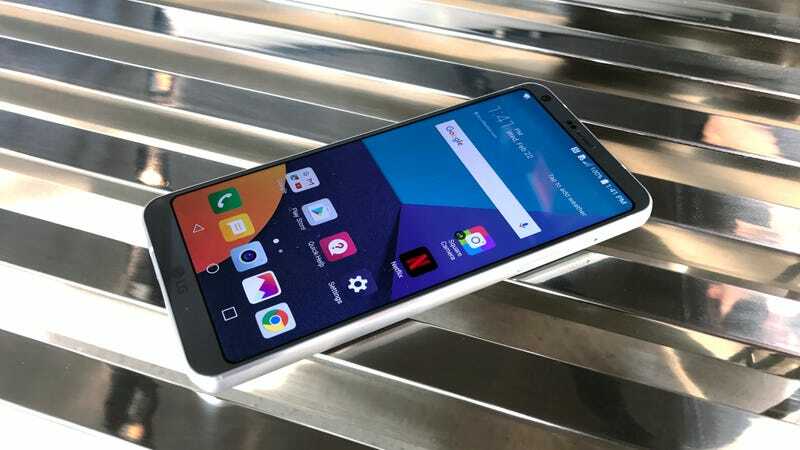 The G6 uses a 13-megapixel camera for its main shooter, a small downgrade from last year’s 16-megapixel camera. LG also decided to bring back its wide angle camera on the back and front, which makes it easier to pull of some neat tricks with the camera. There are other gimmicky features in the camera app—like combining two halves of a photo into one image—but most of the “new” tricks have been available for years in other third-party camera apps. Another detail that camera fans will love is the huge upgrade to the phone’s selfie camera. The G6 has a 5-megapixel front-facing camera that’s capable of shooting normal or 100-degree wide-angle shots. The quality looked great on our cursory tests, but obviously this is something we’ll dive deeper into during our official review. It’s also worth noting that we’ve been really happy with LG phone cameras in the past and have high hopes for the LG G6 based on our very limited time playing with it. There are other software upgrades, like the new UI built specifically for the 18:9 aspect ratio called UX 6.0. The aggressive redesign is largely based on Google’s stock Android operating system, but should still feel familiar to anyone who’s ever used an older LG phones. It’s a more simple version of what LG had last year, but it’s safe to say it’s still not as good as stock Android. The new UI also comes with a few tweaks to LG’s pre-loaded apps like the calendar or email that take advantage of the phone’s large display. More often than not, when you’re using the default apps, you’ll notice the screen is cut exactly in half, making two perfect squares. It’s a clean look and something LG wanted people to experience on all of the phone’s default apps. It’s certainly something that’s different than we’re used to seeing, but not quite as radical as LG is playing it up to be. The LG G6 is also the first flagship to ship with Google Assistant that’s not the Google Pixel. I wouldn’t call this a dealmaker, though, because Google Assistant will most likely become available in other phones sometime in the near future. It’s also not that useful, anyways. The LG G6 is packed with a bunch of other quality guts that you’d expect from a flagship Android phone. It has the latest Qualcomm processor (Snapdragon 821), 4 gigabytes of RAM, a microSD card expansion slot that pops out of the side, a 3,200 mAh non-replaceable battery, and a water resistant IP68 rating, meaning it can be immersed in liquid up to 1 meter deep. The tech specs are pretty standard for a premium phone. So is the G6 enough to save LG’s floundering mobile division? The climb back to relevancy is extremely steep given and LG is facing a lot of tough competition. There is, of course, the forthcoming Samsung Galaxy S8 release, which we have extremely high hopes for. Then, there’s also the Google Pixel, which was a solid Android phone that left plenty of room for improvement. Based on our first impressions, the LG G6 only feels slightly better than the Pixel because of its camera capabilities, brushed aluminum body, and slightly thinner body. Whether it’s enough to lure people over from other Android phones remains to be seen. As always, we’ll investigate more thoroughly in our official review after spending a few weeks with this thing.